“Things could be on track” for a vote on the Raiders’ potential relocation to take place during the upcoming owners meetings from March 26-29, NFL spokesman Brian McCarthy informed Paul Gutierrez of ESPN.com. Indeed, the Raiders are “on course” to apply for Las Vegas relocation at the meetings, a source told Gutierrez. If a vote is held, Mark Davis will need 23 of the league’s other 31 owners to sign off on his Vegas plan. Before that happens, though, owners want to know where the Raiders would play in 2019, according to Gutierrez. They’re going to remain in Oakland the next two seasons, and the potential Las Vegas stadium wouldn’t open until 2019, leaving a one-year gap. Florida State running back and first-round prospect Dalvin Cook is in Philadelphia meeting with the Eagles, reports Mike Garafolo of NFL.com (Twitter link). The Eagles finished an unimpressive 18th in the league in yards per carry last season and don’t have a high-end No. 1 rusher, so it’s possible they’ll give Cook serious consideration if he’s on the board at No. 14. One of Cook’s fellow draft-bound running backs, Oklahoma’s Joe Mixon, visited the Broncos on Thursday, per ESPN’s Dan Graziano. Mixon met privately with both Broncos CEO Joe Ellis and general manager John Elway, adds Mike Klis of 9News (Twitter links). Terence Newman told reporters that his agent spoke with the Raiders on the same day he spoke to the Vikings, but Oakland did not make an offer (Twitter link via Mark Craig of the Star Tribune). Regardless, the Vikings were Newman’s top choice. This week, the cornerback agreed to return to Minnesota for his age-39 season. Although the Bengals’ Andre Smith has served as an offensive tackle during his entire eight-year career, he’ll shift to right guard in his ninth season, writes Geoff Hobson of the team’s website. “We think he has chance to be a really good player for us there,” said Bengals offensive line coach Paul Alexander. Smith, who spent his first seven seasons in Cincinnati and 2016 in Minnesota, returned to the Bengals on Tuesday on a one-year deal. He’ll replace former line mate and standout right guard Kevin Zeitler, who signed a massive contract with the AFC North rival Browns at the outset of free agency. While the Vikings have shown interest in free agent cornerback Nickell Robey-Coleman, they aren’t among the teams that have booked visits with him, tweets Ben Goessling of ESPN.com. Offensive lineman Gosder Cherilus has officially announced his retirement (Twitter link). After initial word that Cherilius would retire, one report said that he was simply not seeking a contract at this time, indicating that the situation was fluid. However, Cherilus is indeed walking away from the game. The Ravens traded center Jeremy Zuttah earlier today, but they haven’t made contact with free agent pivot Nick Mangold as of yet, tweets Jeff Zriebec of the Baltimore Sun. Instead, Baltimore is likely to turn over center to internal option John Urschel, or look for another free agent on the open market. While contending clubs were expected to pursue Mangold, he hasn’t drawn any known interest so far this offseason. Teams are reportedly asking the 33-year-old if he’s willing to shift to guard. Interior offensive lineman Evan Smith received a $1MM roster bonus on Wednesday, a clear indication that he’ll be a member of the Buccaneers‘ 2017 roster, as Greg Auman of the Tampa Bay Times details. Smith has only started seven games over the past two seasons, and will likely remain the Bucs’ top reserve at the pivot and both guard spots after center Joe Hawley re-signed earlier today. As Auman writes, Tampa Bay’s front five is currently in flux, and a number of line combinations could be in play next year. Smith, 30, will earn a base salary of $3.5MM in 2017 while carrying a cap charge of $4.5MM. 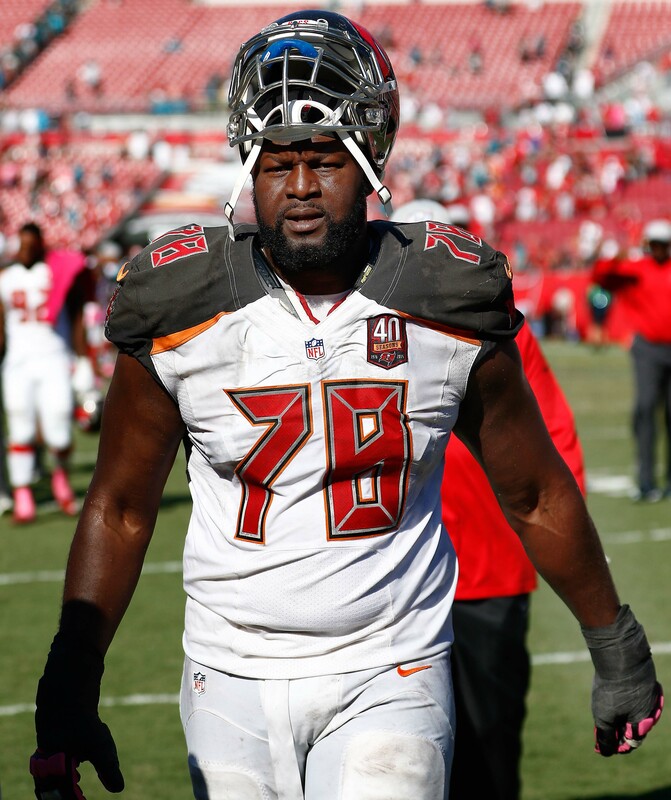 Although one report indicated Buccaneers offensive tackle Gosder Cherilus retired yesterday, the veteran lineman has not formally decided to hang up his cleats, as Auman tweets. However, Cherilus is not seeking a new contract and won’t participate in the free agent process. This could be a “soft retirement” for Cherlius, could simply be a matter of semantics. Cherilus, 32, has played nine NFL seasons. Free agent linebacker Dekoda Watson is visiting a team tonight and has another meeting scheduled for Thursday, though it’s not clear at present exactly which clubs are involved, as Nicki Jhabvala of the Denver Post tweets. The 28-year-old Watson appeared in all 16 games for the Broncos in 2016, playing on 84% of the team’s special teams snaps. Denver is reportedly interested in retaining him. Offensive tackle Gosder Cherilus is planning to retire, reports Jeremy Fowler of ESPN.com (Twitter link). Cherilus is an unrestricted free agent, but he won’t participate in the free agent process, per Fowler. Cherilus, 32, began his career as a first-round pick of the Lions in 2008. The Boston College alum was a full-time starter that season, as he would be for the next eight campaigns. After his rookie contract expired, Cherilus signed a five-year, $35MM contract with the Colts that made him the highest-paid right tackle in the NFL. After two years in Indianapolis, Cherilus was released, his tenure with the Colts not nearly as successful as his run with Detroit. Cherilus quickly landed with the Buccaneers, and started 13 games in 2015 before becoming a reserve this past season. In 2016, Cherilus only played on about 20% of Tampa Bay’s offensive snaps. All told, Cherilus appeared in 131 games over his nine-year NFL career. Ultimately, he lived up to his draft billing, as he’s currently the 20th-most valuable member of the 2008 draft by approximate value. PFR wishes Cherilus nothing but the best as he enters retirement. Safety Omar Bolden was released by the Bears yesterday, but Troy Renck of Denver7 ABC tweets that the 27-year-old “will land on his feet.” Renck notes that the former Broncos draft pick could wind up in Denver, and he adds that his release from the Bears was due to the team’s “logjam” at defensive back. If Buccaneers offensive lineman Gosder Cherilus proves to be nothing more than a backup to Demar Dotson, Greg Auman of the Tampa Bay Times could see the team letting go of him and his $4.5MM salary. Other veterans who could find themselves on the hot seat include offensive lineman Evan Dietrich-Smith, defensive end George Johnson, tight end Brandon Myers, and safety Major Wright. The Packers had offered B.J. Raji a “lucrative” contract, indicating that they expected him to play a major role on their 2016 squad. However, as ESPN.com’s Rob Demovsky writes, the defensive lineman’s one-year hiatus from the NFL suddenly changed the organization’s offseason plans. Could this finally be Rueben Randle‘s breakout year? The wide receiver has long been expected to emerge as a star in New York and the Giants have a feeling that 2015 could be his time to shine, Jason Cole of Bleacher Report (video link) says. Randle is entering his contract year and a strong performance could lead him to a sizable payday in the offseason, whether it’s with the Giants or another squad. GM Jerry Reese also believes that the presence of Odell Beckham Jr. and the returning Victor Cruz will open things up for the 24-year-old. Here’s more from around the NFL..
Bills running back LeSean McCoy suffered a hamstring injury earlier today and the team ordered an MRI to determine the severity of it. Jason La Canfora of CBSSports.com (on Twitter) now wonders if Ray Rice‘s best shot for a deal could be in Buffalo. Head coach Rex Ryan and Rice have a shared history thanks to their time together in Baltimore. 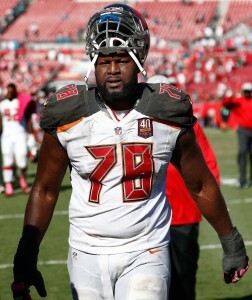 Buccaneers coach Lovie Smith says the starting right tackle job is up for grabs, though he added that he wouldn’t have signed Gosder Cherilus if they didn’t expect him to help right away, Scott Smith of Buccaneers.com tweets. Tampa Bay signed the veteran to a lucrative two-year deal on Monday. Cherilus says he believes the Bucs would have drafted him if he lasted until pick No. 20 in 2008, Smith tweets. The offensive lineman wound up going 17th to the Lions instead. Last week, the Broncos claimed Spencer Lanning off waivers when the Buccaneers waived him and Troy Renck of The Denver Post (on Twitter) notes that the Broncos put in a claim back when the Browns cut him loose. This means that Lanning has been on the radar for Denver for quite a while and this could be an indication that he has momentum going into the team’s kicking competition. TUESDAY, 9:06am: The Buccaneers have officially confirmed the signing of Cherilus, announcing that they’ve cut FB/TE Evan Rodriguez to clear room on the roster (Twitter link). The details on Cherilus’ two-year deal can be found here. MONDAY, 3:09pm: After hosting free agent offensive tackle Gosder Cherilus for a visit today, the Buccaneers have agreed to terms with him on a two-year contract, reports Rick Stroud of the Tampa Bay Times (Twitter link). As Stroud adds (via Twitter), Cherilus is poised to replace injured right tackle Demar Dotson, who could be sidelined for six to eight weeks with a sprained MCL. Cherilus, who was released by the Colts in late July, started 29 games for the club at right tackle over the past two seasons. However, after a solid first season in Indianapolis, the 31-year-old struggled last year. Pro Football Focus (subscription required) ranked Cherilus 70th out of 84 qualified tackles, and he graded particularly poorly as a pass blocker. According to PFF’s data, he allowed six quarterback sacks, another 42 hits or hurries. Despite his down year, Cherilus appeared to draw plenty of interest when he became a free agent. The veteran tackle reportedly visited the Bills and Lions, and Stroud tweets that the Chiefs and Vikings had some interest in him as well. Per Stroud, the Colts were also interested in bringing back Cherilus at a reduced salary. While the financial terms of Cherilus’ new two-year deal with the Bucs aren’t yet known, he’ll certainly make less than he would have in Indianapolis, had the Colts held onto him. The former first-round pick signed a five-year, $35MM contract with the Colts back in 2013, and would’ve counted for $6.9MM against the team’s cap in 2015, including a $4MM base salary, if he hadn’t been released. In Tampa Bay, Cherilus looks like the favorite to start the season at right tackle, though it’s not clear if he’ll continue to get regular playing time after Dotson returns from his MCL injury. Currently, second-round pick Donovan Smith is penciled in as the Bucs’ starter at left tackle, so his performance early in the season could determine whether or not there’s room on the line for Cherilus throughout the year. Over the weekend, the Chargers and quarterback Philip Rivers reached agreement on a lucrative four-year extension worth $84MM. Today, we learned the details of the contract. Rivers will earn a $22.5MM signing bonus with $15MM fully guaranteed in 2015, Mike Garafolo of FOX Sports tweets. He’ll have a $16.5MM injury-only guarantee in 2016 which converts to a full guarantee on the second day of the ’16 waiver period. In 2017, Rivers will earn $14MM with $11MM guaranteed for injury only that will convert to a full guarantee on the second day of the waiver period. In the final two years, he’ll make $10MM and $11MM, respectively, with a $5MM roster bonus in each of those seasons. That’s big bucks for the Bolts QB, but as we learned earlier tonight, that kind of deal apparently isn’t good enough for Giants quarterback Eli Manning. Here’s more from around the NFL..
T.Y. Hilton‘s deal with the Colts calls for him to earn base salaries of $1MM, $3MM, $8MM, $11MM, $13MM, and $14.54MM, Mike Chappell of the Indy Star tweets. Hilton’s new deal with Indianapolis could pay him $65MM in total with $39MM guaranteed. Contract talks between the Lions and defensive tackle Haloti Ngata are ongoing and positive, Rand Getlin of NFL.com tweets. Ngata, a five-time All Pro, indicated in March that he would be open to an extension, and Lions GM Martin Mayhew has said that team management is also interested in working out a long-term deal. Gosder Cherilus‘ deal with the Buccaneers is worth $7MM over two years, a source tells Ian Rapoport of NFL.com (on Twitter). The offensive lineman will earn $2.5MM this year and $4.5MM next year. Cherilus gets a $500K roster bonus in 2016 and his $2M base salary escalates to $3M if he plays 75 percent of the snaps in 2015, Rick Stroud of the Tampa Bay Times tweets. Cardinals UDFA rookie linebacker Zack Wagenmann broke his foot again and will miss the entire 2015 season, a source tells Adam Caplan of ESPN.com (on Twitter). Free agent offensive tackle Gosder Cherilus is expected to visit the Buccaneers on Monday, reports Greg Auman of the Tampa Bay Times (Twitter link). Cherilus, who has visited with the Bills and Lions in recent weeks, is in search of work after the Colts released him in late July. The 31-year-old signed a five-year, $35MM contract with the Colts in 2013, and started 29 games for the club at right tackle over the past two seasons. However, after a solid first season in Indianapolis, he struggled last year. Pro Football Focus (subscription required) ranked Cherilus 70th out of 84 qualified tackles, and he graded particularly poorly as a pass blocker. According to PFF’s data, he allowed six quarterback sacks, another 42 hits or hurries. Prior to his time with the Colts, Cherilus spent the first five years of his career with the Lions after they used a first-round pick on him in 2008. The former Boston College standout has appeared in 104 games and made 100 starts as a pro. The Bengals are considering adding a veteran receiver to compete in training camp for a roster spot and playing time, and they worked out a couple interesting names today, according to Rand Getlin of the NFL Network (Twitter link). Getlin reports that, in addition to Greg Little, Santonio Holmes and David Nelson also auditioned for Cincinnati. Holmes, a longtime Jet, played for the Bears in 2014, while Nelson has accumulated 138 receptions in five seasons with the Bills and Jets. So far, none of the three wideouts have signed with the Bengals. Having visited the Bills and Lions, offensive tackle Gosder Cherilus headed home today without a deal in place, and will assess his options, tweets Mike Garafolo of FOX Sports. If Cherilus is deciding between Buffalo and Detroit and doesn’t plan on making any more visits, I’d expect him to sign soon. Another veteran offensive lineman who made some visits this week also remains on the market, according to Troy Renck of the Denver Post, who writes that Jake Long‘s meeting with the Broncos ended without the club signing the former No. 1 pick. Long is also said to be drawing interest from the Falcons and Giants. The Cowboys have been linked to free agent running backs most of the offseason, but executive VP Stephen Jones says the team doesn’t have any plans to bring in another one at this point. The team will, however, add a couple linebackers, according to Jones (Twitter link via Charean Williams of the Fort Worth Star-Telegram). Free agent cornerback Josh Victorian, who last played a regular season game for Houston in 2013, tried out for the Titans, a source tells Aaron Wilson of the National Football Post (Twitter link).